Use a conditional format to help you visually explore and analyze data, detect critical issues, and identify patterns and trends. Conditional formatting makes it easy to highlight interesting cells or ranges of cells, emphasize unusual values, and visualize data by using data bars, color scales, and icon sets. A conditional format changes the appearance of a cell range based on conditions (or criteria). If the condition is true, the cell range is formatted based on that condition; if the condition is false, the cell range is not formatted based on that condition. You can sort and filter by format, including cell background color and font color, whether you have manually or conditionally formatted the cells. The following example shows conditional formatting that uses cell background colors, a 3 arrow icon set, and data bars. You can apply conditional formatting to a cell range, an Excel table, or a PivotTable report. There are important differences to understand when you use conditional formatting on a PivotTable report. Note: When you create a conditional format, you can reference only other cells on the same worksheet or, in certain cases, cells on worksheets in the same currently open workbook. You can't use conditional formatting on external references to another workbook. If you change the layout of the PivotTable report by filtering, hiding levels, collapsing and expanding levels, or moving a field, the conditional format is maintained as long as the fields in the underlying data are not removed. The default method of scoping fields in the Values area is by selection. You can change the scoping method to the corresponding field or value field by using the Apply formatting rule to option button, the New Formatting Rule dialog box, or the Edit Formatting Rule dialog box. A contiguous set of fields in the Values area, such as all of the product totals for one region. A non-contiguous set of fields in the Values area, such as product totals for different regions across levels in the data hierarchy. Avoid making many non-contiguous selections. Conditionally format a set of fields in the Values area for all levels in the hierarchy of data. Include subtotals and grand totals. Conditionally format a set of fields in the Values area for one level in the hierarchy of data. A column and its parent row field. A row and its parent column field. Note: Quick Analysis is not available in Excel 2010 and previous versions. Use the Quick Analysis button to apply selected conditional formatting to the selected data. The Quick Analysis button appears automatically when you select data in your spreadsheet. Select the data in your spreadsheet. The Quick Analysis button appears on the lower-right corner of the selection. Then, on the Formatting tab, move your mouse over the different options to see a Live Preview on your data, and then click on a formatting option. The formatting options that appear in the Formatting tab will depend on the data you have selected. If your selection contains only text, then the available options are Text, Duplicate, Unique, Equal To, and Clear. When the selection contains only numbers, or both text and numbers, then the options are Data Bars, Colors, Icon Sets, Greater, Top 10%, and Clear. Live preview will only render for those formatting options that can be used on your data. For example, if your selected cells don't contain matching data and you select Duplicate, the live preview will not work. If the Text that Contains dialog box appears, enter the formatting option you want to apply and click OK. If your conditional formatting needs are more complex, you can use a logical formula to specify the formatting criteria. For example, you may want to compare values to a result returned by a function or evaluate data in cells outside the selected range, which can be in another worksheet in the same workbook. To add a conditional format, click New Rule. The New Formatting Rule dialog box appears. Make sure that the appropriate worksheet, table, or PivotTable report is selected in the Show formatting rules for list box. Optionally, change the range of cells by clicking Collapse Dialog in the Applies to box to temporarily hide the dialog box, by selecting the new range of cells on the worksheet or other worksheets, and then by selecting Expand Dialog . Select the rule, and then click Edit rule. The Edit Formatting Rule dialog box appears. Corresponding field: Click All cells showing <Values field> values. Value field: Click All cells showing <Values field> for <Row>. Under Select a Rule Type, click Use a formula to determine which cells to format. Under Edit the Rule Description, in the Format values where this formula is true list box, enter a formula. You have to start the formula with an equal sign (=), and the formula must return a logical value of TRUE (1) or FALSE (0). Select the number, font, border, or fill format you want to apply when the cell value meets the condition, and then click OK.
You can choose more than one format. The formats you select are shown in the Preview box. In the example shown here, the first rule formats two cells green if both conditions are true. If the result of that test is not True, the second rule formats two cells red if either of the conditions are False. A home buyer has budgeted up to $75,000 as a down payment and $1,500 per month as a mortgage payment. If both the down payment and the monthly payments fit these requirements, cells B4 and B5 are formatted green. If either the down payment or the monthly payment meet the buyer's budget, B4 and B5 are formatted red. Change some values, such as the APR, the loan term, the down payment, and the purchase amount to see what happens with the conditionally formatted cells. 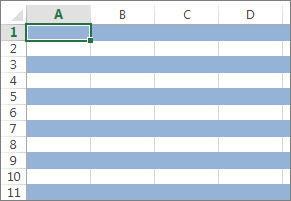 A conditional format applied to every cell in this worksheet shades every other row in the range of cells with a blue cell color. You can select all cells in a worksheet by clicking the square above row 1 and to the left of column A. The MOD function returns a remainder after a number (the first argument) is divided by divisor (the second argument). The ROW function returns the current row number. When you divide the current row number by 2, you always get either a 0 remainder for an even number or a 1 remainder for an odd number. Because 0 is FALSE and 1 is TRUE, every odd numbered row is formatted. The rule uses this formula: =MOD(ROW(),2)=1. Note: You can enter cell references in a formula by selecting cells directly on a worksheet or other worksheets. Selecting cells on the worksheet inserts absolute cell references. If you want Excel to adjust the references for each cell in the selected range, use relative cell references. For more information on using formulas in conditional formatting, see Use a formula to apply conditional formatting. Color scales are visual guides that help you understand data distribution and variation. A two-color scale helps you compare a range of cells by using a gradation of two colors. The shade of the color represents higher or lower values. For example, in a green and yellow color scale, as shown below, you can specify that higher value cells have a more green color and lower value cells have a more yellow color. Tip: If any cells in the range contain a formula that returns an error, the conditional formatting is not applied to those cells. To ensure that the conditional formatting is applied to those cells, use an IS or IFERROR function to return a value other than an error value. On the Home tab, in the Styles group, click the arrow next to Conditional Formatting, and then click Color Scales. Hover over the color scale icons to see which icon is a two-color scale. The top color represents higher values, and the bottom color represents lower values. You can change the method of scoping for fields in the Values area of a PivotTable report by using the Formatting Options button that appears next to a PivotTable field that has conditional formatting applied. On the Home tab, in the Styles group, click the arrow next to Conditional Formatting, and then click Manage Rules. The Conditional Formatting Rules Manager dialog box appears. Optionally, change the range of cells by clicking Collapse Dialog in the Applies to box to temporarily hide the dialog box, by selecting the new range of cells on the worksheet, and then by selecting Expand Dialog . All cells for a Value label: Click All cells showing <Value label> values. All cells for a Value label, excluding subtotals and the grand total: Click All cells showing <Value label> values for <Row Label>. Under Select a Rule Type, click Format all cells based on their values (default). Under Edit the Rule Description, in the Format Style list box, select 2-Color Scale. Format lowest and highest values: Select Lowest Value and Highest Value. In this case, you do not enter a Minimum and MaximumValue. Format a number, date, or time value: Select Number and then enter a Minimum and MaximumValue. Format a percentage Percent: Enter a Minimum and MaximumValue. Valid values are from 0 (zero) to 100. Don't enter a percent sign. Use a percentage when you want to visualize all values proportionally because the distribution of values is proportional. Format a percentile: Select Percentile and then enter a Minimum and MaximumValue. Valid percentiles are from 0 (zero) to 100. Use a percentile when you want to visualize a group of high values (such as the top 20thpercentile) in one color grade proportion and low values (such as the bottom 20th percentile) in another color grade proportion, because they represent extreme values that might skew the visualization of your data. Format a formula result: Select Formula and then enter values for Minimum and Maximum. The formula must return a number, date, or time value. Start the formula with an equal sign (=). Invalid formulas result in no formatting being applied. It's a good idea to test the formula to make sure that it doesn't return an error value. Make sure that the Minimum value is less than the Maximum value. You can choose a different type for the Minimum and Maximum. For example, you can choose a number for Minimum a percentage for Maximum. To choose a Minimum and Maximum color scale, click Color for each, and then select a color. If you want to choose additional colors or create a custom color, click More Colors. The color scale you select is shown in the Preview box. Color scales are visual guides that help you understand data distribution and variation. A three-color scale helps you compare a range of cells by using a gradation of three colors. The shade of the color represents higher, middle, or lower values. For example, in a green, yellow, and red color scale, you can specify that higher value cells have a green color, middle value cells have a yellow color, and lower value cells have a red color. Tip: If any cells in the range contain a formula that returns an error, the conditional formatting is not applied to those cells. To ensure that the conditional formatting is applied to those cells, use an IS or IFERROR function to return a value that you specify (such as 0, or "N/A") instead of an error value. Select a three-color scale. The top color represents higher values, the center color represents middle values, and the bottom color represents lower values. Hover over the color scale icons to see which icon is a three-color scale. You can change the method of scoping for fields in the Values area of a PivotTable report by using the Formatting Options button that appears next to a PivotTable field that has conditional formatting applied.. Selection: Click Just these cells. Corresponding field: Click All <value field> cells with the same fields. Value field: Click All <value field> cells. Under Select a Rule Type, click Format all cells based on their values. Under Edit the Rule Description, in the Format Style list box, select 3-Color Scale. Format lowest and highest values: Select a Midpoint. In this case, you do not enter a Lowest and HighestValue. Format a number, date, or time value: Select Number and then enter a value for Minimum, Midpoint, and Maximum. Format a percentage: Select Percent and then enter a value for Minimum, Midpoint, and Maximum. Valid values are from 0 (zero) to 100. Do not enter a percent (%) sign. Use a percentage when you want to visualize all values proportionally, because using a percentage ensures that the distribution of values is proportional. Format a percentile: Select Percentile and then enter a value for Minimum, Midpoint, and Maximum. Valid percentiles are from 0 (zero) to 100. Use a percentile when you want to visualize a group of high values (such as the top 20th percentile) in one color grade proportion and low values (such as the bottom 20th percentile) in another color grade proportion, because they represent extreme values that might skew the visualization of your data. Format a formula result: Select Formula and then enter a value for Minimum, Midpoint, and Maximum. The formula must return a number, date, or time value. Start the formula with an equal sign (=). Invalid formulas result in no formatting being applied. It's a good idea to test the formula to make sure that it doesn't return an error value. You can set minimum, midpoint, and maximum values for the range of cells. Make sure that the value in Minimum is less than the value in Midpoint, which in turn is less than the value in Maximum. You can choose a different type for Minimum, Midpoint, and Maximum. For example, you can choose a Minimum number, Midpoint percentile, and Maximum percent. In many cases, the default Midpoint value of 50 percent works best, but you can adjust this to fit unique requirements. To choose a Minimum, Midpoint, and Maximum color scale, click Color for each, and then select a color. To choose additional colors or create a custom color, click More Colors. The color scale you select is shown in the Preview box. A data bar helps you see the value of a cell relative to other cells. The length of the data bar represents the value in the cell. A longer bar represents a higher value, and a shorter bar represents a lower value. Data bars are useful in spotting higher and lower numbers, especially with large amounts of data, such as top selling and bottom selling toys in a holiday sales report. The example shown here uses data bars to highlight dramatic positive and negative values. You can format data bars so that the data bar starts in the middle of the cell, and stretches to the left for negative values. Tip: If any cells in the range contain a formula that returns an error, the conditional formatting is not applied to those cells. To ensure that the conditional formatting is applied to those cells, use an IS or IFERROR function to return a value (such as 0 or "N/A") instead of an error value. On the Home tab, in the Style group, click the arrow next to Conditional Formatting, click Data Bars, and then select a data bar icon. You can change the method of scoping for fields in the Values area of a PivotTable report by using the Apply formatting rule to option button. Under Edit the Rule Description, in the Format Style list box, select Data Bar. In this case, you do not enter a value for Minimum and Maximum. Format a percentage: Select Percent and then enter a value for Minimum and Maximum. Valid values are from 0 (zero) to 100. Do not enter a percent (%) sign. Format a percentile Select Percentile and then enter a value for Minimum and Maximum. Use a percentile when you want to visualize a group of high values (such as the top 20th percentile) in one data bar proportion and low values (such as the bottom 20th percentile) in another data bar proportion, because they represent extreme values that might skew the visualization of your data. Format a formula result Select Formula, and then enter a value for Minimum and Maximum. The formula has to return a number, date, or time value. You can choose a different type for Minimum and Maximum. For example, you can choose a Minimum number and a Maximum percent. To choose a Minimum and Maximum color scale, click Bar Color. If you want to choose additional colors or create a custom color, click More Colors. The bar color you select is shown in the Preview box. To show only the data bar and not the value in the cell, select Show Bar Only. To apply a solid border to data bars, select Solid Border in the Border list box and choose a color for the border. To choose between a solid bar and a gradiated bar, choose Solid Fill or Gradient Fill in the Fill list box. To format negative bars, click Negative Value and Axis and then, in the Negative Value and Axis Settings dialog box, choose options for the negative bar fill and border colors. You can choose position settings and a color for the axis. When you are finished selecting options, click OK.
You can change the direction of bars by choosing a setting in the Bar Direction list box. This is set to Context by default, but you can choose between a left-to-right and a right-to-left direction, depending on how you want to present your data. Use an icon set to annotate and classify data into three to five categories separated by a threshold value. Each icon represents a range of values. For example, in the 3 Arrows icon set, the green up arrow represents higher values, the yellow sideways arrow represents middle values, and the red down arrow represents lower values. 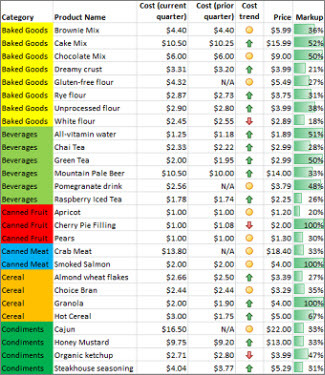 The example shown here works with several examples of conditional formatting icon sets. You can choose to show icons only for cells that meet a condition; for example, displaying a warning icon for those cells that fall below a critical value and no icons for those that exceed it. To do this, you hide icons by selecting No Cell Icon from the icon drop-down list next to the icon when you are setting conditions. You can also create your own combination of icon sets; for example, a green "symbol" check mark, a yellow "traffic light", and a red "flag." On the Home tab, in the Style group, click the arrow next to Conditional Formatting, click Icon Set, and then select an icon set. Under Edit the Rule Description, in the Format Style list box, select Icon Set. Select an icon set. The default is 3 Traffic Lights (Unrimmed). The number of icons and the default comparison operators and threshold values for each icon can vary for each icon set. You can adjust the comparison operators and threshold values. The default range of values for each icon are equal in size, but you can adjust these to fit your unique requirements. Make sure that the thresholds are in a logical sequence of highest to lowest from top to bottom. Format a number, date, or time value: Select Number. Format a percentage: Select Percent. Format a percentile: Select Percentile. Valid percentiles are from 0 (zero) to 100. Use a percentile when you want to visualize a group of high values (such as the top 20th percentile) using a particular icon and low values (such as the bottom 20th percentile) using another icon, because they represent extreme values that might skew the visualization of your data. Format a formula result: Select Formula, and then enter a formula in each Value box. To make the first icon represent lower values and the last icon represent higher values, select Reverse Icon Order. To show only the icon and not the value in the cell, select Show Icon Only. You may need to adjust the column width to accommodate the icon. The size of the icon shown depends on the font size that is used in that cell. As the size of the font is increased, the size of the icon increases proportionally. 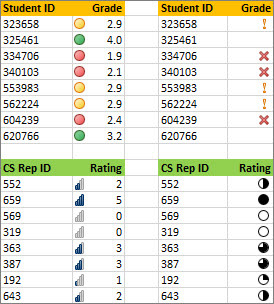 To more easily find specific cells within a range of cells, you can format those specific cells based on a comparison operator. For example, in an inventory worksheet sorted by categories, you can highlight the products with fewer than 10 items on hand in yellow. Or, in a retail store summary worksheet, you can identify all stores with profits greater than 10%, sales volumes less than $100,000, and region equal to "SouthEast." The examples shown here work with examples of built-in conditional formatting criteria, such as Greater Than, and Top %. 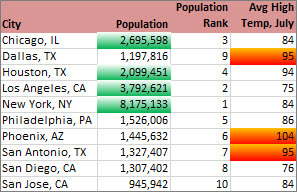 This formats cities with a population greater than 2,000,000 with a green background and average high temperatures in the top 30% with orange. Note: You cannot conditionally format fields in the Values area of a PivotTable report by text or date, only by number. Select the command you want, such as Between, Equal To Text that Contains, or A Date Occurring. Enter the values you want to use, and then select a format. Optionally, change the range of cells by clicking Collapse Dialog in the Applies to box to temporarily hide the dialog box, by selecting the new range of cells on the worksheet or on other worksheets, and then by selecting Expand Dialog . Format by number, date, or time: Select Cell Value, select a comparison operator, and then enter a number, date, or time. For example, select Between and then enter 100 and 200, or select Equal to and then enter 1/1/2009. You can also enter a formula that returns a number, date, or time value. If you enter a formula, start it with an equal sign (=). Format by text: Select Specific Text, choosing a comparison operator, and then enter text. For example, select Contains and then enter Silver, or select Starting with and then enter Tri. Quotes are included in the search string, and you may use wildcard characters. The maximum length of a string is 255 characters. You can also enter a formula that returns text. Format by date: Select Dates Occurring and then select a date comparison. For example, select Yesterday or Next week. Format cells with blanks or no blanks: Select Blanks or No Blanks. A blank value is a cell that contains no data and is different from a cell that contains one or more spaces (spaces are considered as text). Format cells with error or no error values: Select Errors or No Errors. Error values include: #####, #VALUE!, #DIV/0!, #NAME?, #N/A, #REF!, #NUM!, and #NULL!. To specify a format, click Format. The Format Cells dialog box appears. You can find the highest and lowest values in a range of cells that are based on a cutoff value you specify. For example, you can find the top 5 selling products in a regional report, the bottom 15% products in a customer survey, or the top 25 salaries in a department . On the Home tab, in the Style group, click the arrow next to Conditional Formatting, and then click Top/Bottom Rules. Select the command you want, such as Top 10 items or Bottom 10 %. Under Select a Rule Type, click Format only top or bottom ranked values. Under Edit the Rule Description, in the Format values that rank in the list box, select Top or Bottom. To specify a top or bottom number, enter a number and then clear the % of the selected range box. Valid values are 1 to 1000. To specify a top or bottom percentage, enter a number and then select the % of the selected range box. Valid values are 1 to 100. Optionally, change how the format is applied for fields in the Values area of a PivotTable report that are scoped by corresponding field. A column and its parent row field, by selecting each Column group. A row and its parent column field, by selecting each Row group. You can find values above or below an average or standard deviation in a range of cells. For example, you can find the above average performers in an annual performance review or you can locate manufactured materials that fall below two standard deviations in a quality rating. Select the command you want, such as Above Average or Below Average. Under Select a Rule Type, click Format only values that are above or below average. To format cells that are above or below the average for all of the cells in the range, select Above or Below. To format cells that are above or below one, two, or three standard deviations for all of the cells in the range, select a standard deviation. You can choose more than one format. The formats you select are displayed in the Preview box. Note: You can't conditionally format fields in the Values area of a PivotTable report by unique or duplicate values. 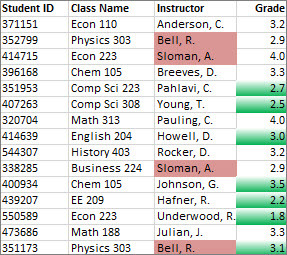 In the example shown here, conditional formatting is used on the Instructor column to find instructors that are teaching more than one class (duplicate instructor names are highlighted in a rose color). Grade values that are found just once in the Grade column (unique values) are highlighted in a green color. If you want to apply an existing formatting style to new or other data on your worksheet, you can use Format Painter to copy the conditional formatting to that data. Click the cell that has the conditional formatting you want to copy. The pointer changes to a paintbrush. Tip: You can double-click Format Painter if you want to keep using the paintbrush to paste the conditional formatting in other cells. To paste the conditional formatting, drag the paintbrush across the cells or ranges of cells you want to format. To stop using the paintbrush, press Esc. Note: If you’ve used a formula in the rule that applies the conditional formatting, you might have to adjust relative and absolute references in the formula after pasting the conditional format. For more information, see Switch between relative, absolute, and mixed references. If your worksheet has one or more cells with a conditional format, you can quickly locate the cells so that you can copy, change, or delete the conditional formats. You can use the Go To Special command to either find only cells with a specific conditional format or find all cells with conditional formats. Click any cell that does not have a conditional format. Click any cell that has the conditional format that you want to find. On the Home tab, click Conditional Formatting > Clear Rules > Clear Rules from Entire Sheet. Select the range of cells, table, or PivotTable for which you want to clear conditional formats. On the Home tab, click Conditional Formatting > Clear Rules. Depending on what you have selected, click Selected Cells, This Table, or This PivotTable. Color scales are visual guides that help you understand data distribution and variation. There are two kinds of color scales—two-color scales and three-color scales. A two-color scale helps you compare a range of cells by using a gradation of two colors. The shade of the color represents higher or lower values. For example, in a green and yellow color scale, you can specify that higher value cells have a more green color and lower value cells have a more yellow color. A three-color scale helps you compare a range of cells by using a gradation of three colors. The shade of the color represents higher, middle, or lower values. For example, in a green, yellow, and red color scale, you can specify that higher value cells have a green color, middle value cells have a yellow color, and lower value cells have a red color. Select one or more cells in a range, table, or a PivotTable. Click Home > Tables > Conditional Formatting > Color Scales and then select a color scale. Click Home > Tables > Conditional Formatting > Data Bars and then select a data bar. Click Home > Tables > Conditional Formatting > Icon Sets and then select an icon set. On the Home tab, in the Tables group, click Highlight Cell Rules. Enter the values you want to use, and then select a format (fill, text, or border color), and then click OK.
You can find the highest and lowest values in a range of cells that are based on a cutoff value you specify. For example, you can find the top 5 selling products in a regional report, the bottom 15% products in a customer survey, or the top 25 salaries in a department. On the Home tab, in the Tables group, click Top/Bottom Rules. You can find unique or duplicate values in a range of cells. On the Home tab, in the Tables group, click Highlight Cell Rules, and then select Duplicate Values. Use Format Painter to copy conditional formatting to other data. Select the cells with the conditional formatting you want to copy to other cells. Right-click the selection > Copy, or press Ctrl+C. Select the first cell in the destination area where you want to paste the conditional formatting. Note: Because you want to paste the formatting only, don't right-click > Paste, or press Ctrl+V. Also, if you've copied data that's in a different number format from the data in the destination area, make sure you adjust the number format in the destination area after you paste the formatting. You can clear conditional formatting in selected cells or the entire worksheet. Select the cells in the worksheet. Click the Home tab > Conditional Formatting > Clear Rules > Clear Rules from Selected Cells. To clear conditional formatting in the entire worksheet, click the Home tab > Conditional Formatting > Clear Rules > Clear Rules from Entire Sheet.